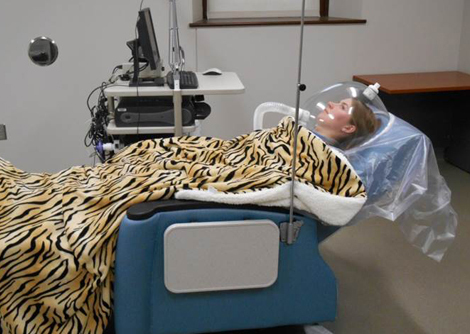 Graduate student Jessica Gwin demonstrates procedures for assessing the resting metabolic rate, which is the calculation of a person's energy expenditure while at rest. The rate is used to determine caloric needs for weight loss, weight gain and weight maintenance. Photos courtesy of the Nutritional Center for Health. A few years back, Chris Hardin went spelunking. But instead of uncovering the mysteries of a watery cave, the scientist explored the dark basement of MU’s nearly century-old Gwynn Hall with a flashlight in his mouth. These days, Gwynn’s interior looks bright and modern after undergoing renovation between October 2013 and January 2014. And in the basement is the gleaming MU Nutritional Center for Health (MUNCH). MU health researchers work across disciplines to develop ways to help people eat healthfully and understand the importance of exercise. This is particularly important for Missourians, of whom one-third of adults and 15 percent of high school students are obese. Scientists say obesity is directly related to chronic health problems like hypertension, diabetes, heart disease and arthritis. “It’s a major health crisis in the U.S.,” said Hardin, MUNCH director and chair of the Department of Nutrition and Exercise Physiology. MUNCH, which is part of the College of Human Environmental Sciences, offers a single location for research and teaching that brings together experts in food science, human environmental sciences, medicine, nutrition and other disciplines. “It takes an integrative facility that allows a range of research into this complicated issue,” Hardin said. 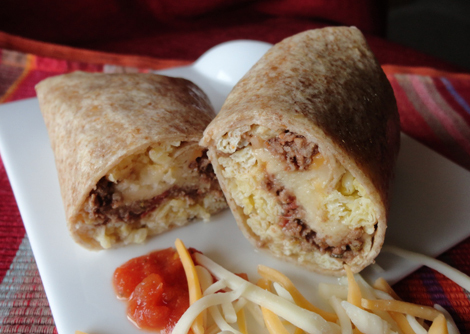 A protein-rich burrito was created in the metabolic kitchen. MUNCH studies how the food we put in our bodies affects us. Three high-definition cameras film the food preparation by scientists and chefs. “Think Food Network,” Hardin said. Sixteen rollaway cooktops are available for people wanting to learn hands-on how to prepare the dishes. MU Extension shows videos of the cooking demonstrations at wellness events across Missouri. The cameras also are used down the hall in the Child Development Lab, where children volunteers, wearing stickers that say “MUNCHkins,” are observed as they sample dishes. Having access to a kitchen where researchers can control every aspect of what participants eat expands the possibilities for compelling food and nutrition research, Hardin said. The results of the studies are further examined next door at the Physical Activity and Wellness Center (PAW). On a recent day, a woman sat in a brown leather chair and read a Kindle. Her arm was hooked up to an IV and her legs were covered with a plush tiger-striped blanket. She was participating in a study about maintaining better glucose and appetite control with a high-protein diet. Her blood was drawn every 30 minutes for 12 hours to measure glucose and hormone levels.